Greentree4, the next generation ERP software, gives you powerful new technology, while retaining all the business functionality you've come to expect. Greentree has always had the philosophy 'to never stand still'. Just as you and your business cannot afford to stand still Greentree can't either. What you see today is just the start of the next leg of the Greentree4 journey. Greentree will continue to evolve and expand as more capabilities come into play. “Greentree4 is as much a revolution as it is an evolution. Greentree4 has all the functionality and credibility that we currently deliver in a Windows environment, sitting seamlessly alongside new browser-based capabilities supporting high-resolution graphics, touch frameworks, pluggable applets (e.g. Google Maps), multimedia and more." This, the latest Greentree upgrade, heralds a new generation in business management and ERP software. 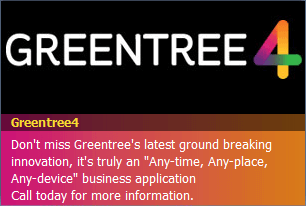 Accessed by both Windows client and browser, Greentree4 gives you the best of both worlds: established core functionality that drives your business engine backed by new powerful browser-based capabilities. After extensive research Greentree settled on HTML5 as the browser platform for its new Greentree4 capabilities. Combined with the visionary technology provided by Gartner favourite, Sencha and the very latest object based platform, JADE7, it creates a powerful “under the bonnet” combination to drive your business engine now and confidently into the future. The new browser-Greentree uniquely co-exists with Greentree’s Windows client access. You can run Greentree4 across a range of devices simultaneously; log in to your desktop, laptop and/or iPad seamlessly. Building on the PRIMED4U philosophy Greentree4 will be continuously developed and delivered with minimal disruption. Greentree4 is as much a revolution as it is an evolution in how it lets you "work it your way".